This holiday season TND residents received toys from Marine Corps Toys for Tots organization. This was the first year our TND children participated in this program. It was a success put on through our resident service departments from The Neighborhood Developers and Nuestra Communidad as well our property manager Winn Residential. This team effort brought the holiday spirit of giving into our properties. 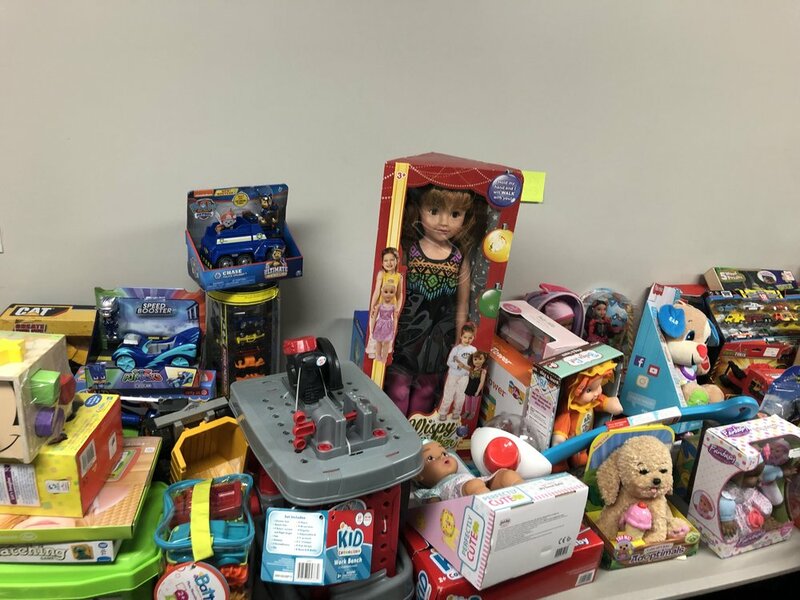 Resident Service received 256 toys from Toys for tots and roughly 160 children were able to pick up their toys that same week! It was a week filled with joy, excitement and smiles. 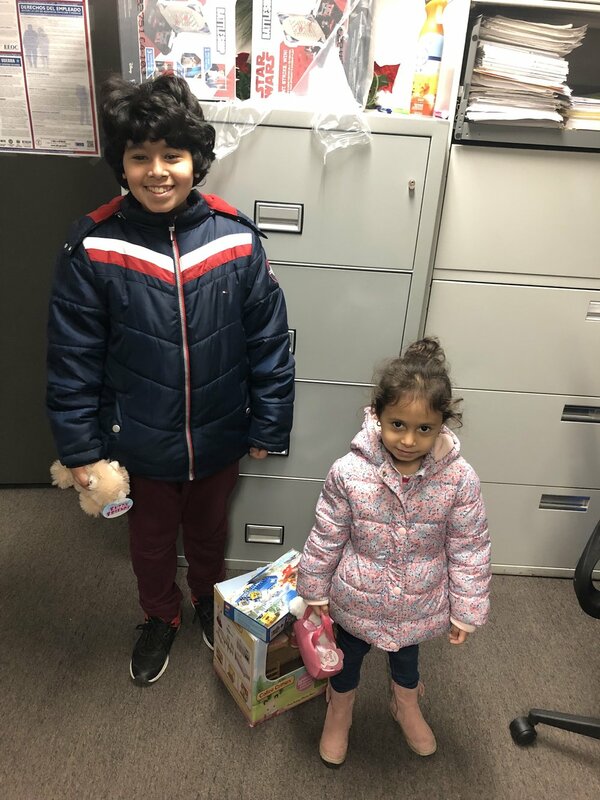 Luckily the children were on winter break so they got to come into our offices and pick up their own toys. The excitement of parents also filled the room that day, some families had worried they would not have a toy for their children for the holidays. They were very surprised and thankful that TND was able to organize this event. PHOENIX, Dec. 3, 2018 (from press release) -- The newly established Republic Services Charitable Foundation has announced the recipients of its first-ever companywide charitable giving program called National Neighborhood Promise™. National Neighborhood Promise grants are designed to deliver critical funding to nonprofit organizations leading neighborhood revitalization projects across the country. "For the first time, our more than 35,000 employees across the country are coming together on a national level to focus our charitable giving efforts more strategically, making significant and lasting impacts on the neighborhoods that need it most," said President and CEO Don Slager. "We're excited about this important step in Republic Services' growth and look forward to making an even bigger difference in the communities we serve." Through National Neighborhood Promise, the Republic Services Charitable Foundation partners with select 501(c)(3) nonprofit organizations to directly support neighborhood revitalization projects and programs within the United States, including Puerto Rico. These partnerships strengthen the neighborhoods in which Republic's employees live and work. Charlotte-Mecklenburg (NC) Housing Partnership, Inc.
Dwelling Place of Grand Rapids (MI) Nonprofit Housing Corp.
For more information about the Republic Services Charitable Foundation and the National Neighborhood Promise program, please visit RepublicServices.com/giving. A BEAUTIFUL POEM TO HOME, COMMUNITY, AND OPPORTUNITY. mundane as the sky but it falls and we are all screwed. New York Times: What's really the most dangerous American city? The way crimes are currently counted can easily confuse and mislead. One morning last year, Michele Carter woke up to find an eviction notice slipped under her apartment door. Boston Globe: Can Boston's developers merge art and equity? Not every city can have a single charismatic visionary like Gates driving creative reuse of urban spaces. Ever since, and long before, the housing market crashed in 2008, with its devastation of homes, neighborhoods and lives, pundits and policy makers have debated the wisdom of advocating for homeownership – particularly in minority communities. Strong Towns: Opportunity Zones, But for Whom? If you’re plugged into the urbanist blogosphere, you’ve probably heard something about the new federal Opportunity Zones by now. Want to better your community but don’t know where to start? A while ago, I read about Juicero, a wifi-connected juicing machine. It was originally $700, and you had to subscribe to these proprietary packets of cut-up fruit and veggies for $7 each. Mass displacement is a crisis': Building clearouts are becoming increasingly common in Boston. A big thank you to the 126 donors that raised $10,043 and who were entered into the drawing for a pair of jetBlue tickets. The contributions will go to serve our mission of home, community, and opportunity. Ramadan is the most holy Islamic holiday of the year, it's a holy month of fasting and prayers for Muslims. During Ramadan Muslims do not eat or drink from sunrise to sunset. They break their fast by sharing meals with family and friends. Last Wednesday June 13th, the residents from 525 Beach in Revere hosted an iftar dinner and invited neighbors and friends; Muslim and non Muslim friends. This was a great opportunity for non Muslims friends to explore and share this culture. A Colombian resident Maria Patino and her son Carlos Patino attended the iftar dinner and stated they were so happy and felt so welcomed to explore and understand their neighbors culture. Maria shared with resident service that everything was, “Estupendo, todo muy rico, me encanto!” (Excellent, everything was so delicious, I enjoyed it!) It was a great night for the residents of 525 Beach, they broke fast together, enjoyed each other's company and learned so much from each other. The community room was filled with noise, laughter, neighborly love and delicious food. Here you can see some dishes that residents and friends shared during the iftar dinner. The harira soup is a very traditional soup served during Ramadan filled with chickpeas, lentils, tomatoes and other fresh veggies. As well you can see all the delicious pastries baked, Sondos Zenina a resident from 525 Beach is known for her famous desserts, on the far left she has baked a pistachio kataifi cake and a friend shared a homemade baklava. This was a great night to remember! On June 7th, in celebration of NeighborWorks Week, TND with the help of many volunteers hosted the Launch into Summer event in Chelsea Square. This annual event on the first Thursday in June is usually hosted in TND's office, but due to the large amount of summer events happening in Chelsea Square this summer, changing the location seemed obvious. Over 100 community members came out to Chelsea Square to enjoy music, play games, learn about resources and most importantly to connect with their neighbors. Thank you to NeighborWorks and all of the resident leaders who volunteered; together you made this event possible. On Thursday May 31st The Neighborhood Developers publicly introduced Rafael Mares as its incoming Executive Director when more than 200 were on hand to celebrate the organization’s 40th Anniversary. Those who welcomed Rafael included Congressman Michael Capuano, Secretary of the MA Executive Office of Housing and Economic Development Jay Ash, EOHED Undersecretary Juan Vega, Senator Sal DiDomenico, Senator Joseph Boncore, Representative Joseph McGonagle, Brian Arrigo Mayor of Revere, and Tom Ambrosino Chelsea City Manager as well as many City Councilors, organizational members, friends and allies. Rafael is well known regionally for his work with the Conservation Law Foundation where as a Vice President and Program Director of the Healthy Communities and Environmental Justice program he has provided legal, technical, and strategic support to equitable transportation and community development efforts. His work on the Fairmount Indigo Corridor, for example, served to improve economic opportunity and mobility for Boston residents in Roxbury, Dorchester, Mattapan, and Hyde Park that were without efficient or rapid transit to downtown employment. Prior to joining the Conservation Law Foundation, Rafael worked at the Wilmer Hale Legal Services Center of Harvard Law School in Jamaica Plain representing indigent tenants in fair housing and eviction matters. 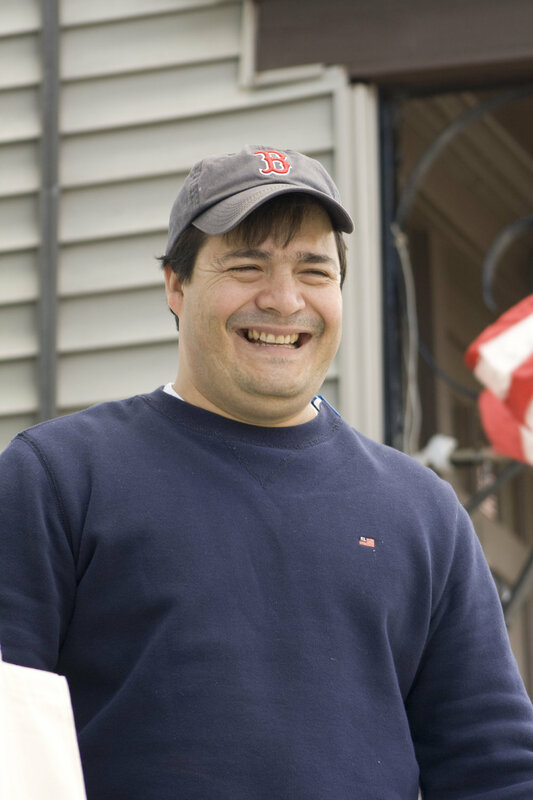 Rafael and his family are residents of Revere, one of three cities served by The Neighborhood Developers. The ability to support equitable development within his own community is part of what drew Rafael to apply to for the position. Also announced at The Neighborhood Developers’ 40th Celebration event was the launch of Opportunity Communities (OppCo), a new and innovative joint-venture launched in April 2018 to increase the capacity of community development nonprofits to sponsor socially just, locally controlled, and equitable change within low- and moderate-income communities. Opportunity Communities was co-founded by The Neighborhood Developers and Nuestra Comunidad of Boston. Across the two non-profits organizations is a housing portfolio of 1,150 apartments, which provide a stable home to over 3,000 low- and moderate-income individuals. Greater scale provides greater opportunity. Through OppCo, The Neighborhood Developers and Nuestra Comunidad are leveraging their combined resources and creating a common, shared set of core operations and programs with significantly more capacity than either organization can afford on its own. The end result is a more sustainable, efficient and robust structure for community development activities that sustains each organization‘s distinct identity, independent non-profit status, and control over mission, assets, and strategy. The model is designed for scale; up to ten community development non-profits are expected to join OppCo in the years ahead. Stepping into the role as CEO of OppCo is Ann Houston, who for the last 14 years has served as the Executive Director of The Neighborhood Developers. Ann Houston joined The Neighborhood Developers in November 2003 with a mandate to expand the organization’s real estate development program. She accomplished this and much, much more. During her tenure with the organization, The Neighborhood Developers completed 16 real estate projects with 378 new or rehabbed homes representing more than $100 million invested in healthy, affordable homes for low and moderate-income households. Other major organizational milestones that occurred during Ann’s tenure include geographic expansion into Revere (2010) and Everett (2017) and the creation of CONNECT, an innovative partnership that supports low-income individuals and families to find a better job and achieve greater economic stability and mobility. At the event another community development organization that is also turning 40 during 2018 -- NeighborWorks America – was recognized as The Neighborhood Developers’ Partner of the Year. NeighborWorks America exists today because 40 years ago, a coalition of residents, government officials, bankers and community members decided to experiment with a new way of making communities better places to live. Instead of public housing projects, this coalition envisioned better, more affordable homes in the places that people need them most. Since its Congressional chartering in 1978, NeighborWorks has expanded to nearly 250 members nationwide. Yet, it has retained what makes it unique: a grassroots approach that allows every organization the flexibility to focus on the needs of its particular community. The Neighborhood Developers is one of the first NeighborWorks organizations formed by a local coalition of Chelsea leaders and benefits from all that NeighborWorks has to offer: technical assistance; flexible grants; comprehensive, tailored training; and the opportunity to interact with and learn from fellow professionals from a variety of sectors. NeighborWorks America exists today because 40 years ago, a coalition of residents, government officials, bankers and community members decided to experiment with a new way of making communities better places to live. Instead of public housing projects, this coalition envisioned better, more affordable homes in the places that people need them most. Since its Congressional chartering in 1978, NeighborWorks has expanded to nearly 250 members nationwide. Yet, it has retained what makes it unique: a grassroots approach that allows every organization the flexibility to focus on the needs of its particular community. TND is one of the first organizations chartered by NeighborWorks America – then known as Neighborhood Reinvestment Corporation. Both organizations are celebrating their 40th anniversaries in 2018. Accepting the TND Partner of the Year Award on behalf of NeighborWorks was Jeffrey Bryson, Interim CEO and President. Joining Jeffrey were Katie Watts, SVP of Field Operations, and Joan Straussman, now Director of the Northeast Region. Also on hand was Margo Kelly who was the first NeighborWorks America representative to support the Chelsea start-up as well as Michael Williams who plays that role today. TND benefits from all that NeighborWorks has to offer: technical assistance; flexible grants; comprehensive, tailored training; and the opportunity to interact with and learn from fellow professionals from a variety of sectors. NeighborWorks America is a tremendously valuable funding partner having invested nearly $8M over the last fifteen years in TND. Through their support for organizational capacity building, NeighborWorks has assisted TND in good times and challenging times. They are a valuable forum for learning – some of our best ideas were nurtured through conversations at NeighborWorks forums and work on national committees. At CONNECT we say that people can’t aspire to what they don’t know about: NeighborWorks America constantly raises our aspirations. The day after the celebration, TND was happy to host our Neighborworks America guests on a tour: Jeffrey Bryson, Katie Watts, and Michael Williams. As we both celebrate our 40th anniversaries, we enjoyed sharing our work and vision for home, community, and opportunity into the future. Jan Dumas is a Shirley Avenue resident of Revere who cares deeply about her neighbors and equitable access to community resources. She is also someone who has shared her powerful personal story as she advocates for affordable homes. Jan Dumas became a TND member five years ago after participating in her first NeighborCircle. She later went on to host her own NeighborCircle at her own home to deepen social connections among her neighbors. During the course of her membership with TND, Jan has completed four leadership trainings, learning how to facilitate NeighborCircles, how to set goals for change in a neighborhood setting, and most recently, she completed a Board Leadership Bootcamp where participants learned how to join a municipal Board. Jan says, “My service dog Neelix and I are part of the team working to make Shirley Avenue a better neighborhood.” As an active Revere Community Committee member, Jan has helped to plan and implement many community building events including five Shirley Cultural Festivals and at least eight neighborhood clean-ups. 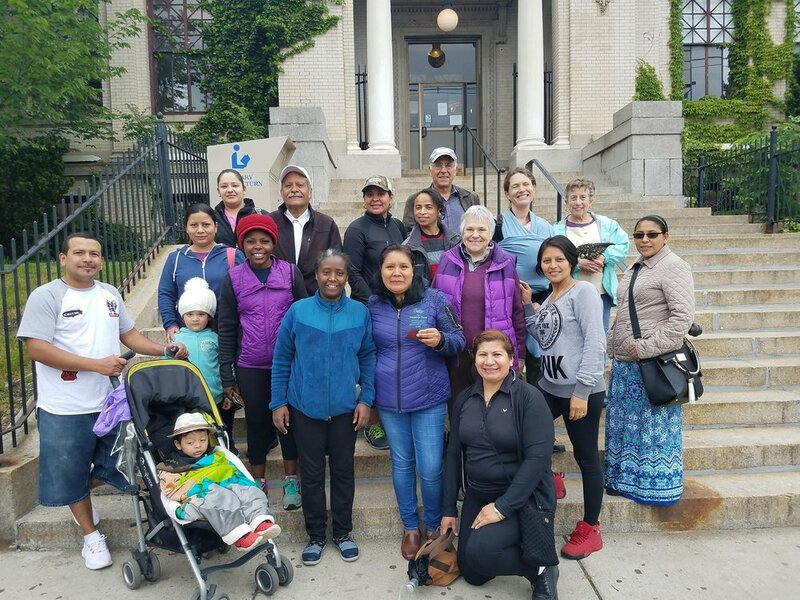 Inspired by another RCC member, she became a proud steward of the second Little Free Library in the City of Revere this past summer, enabling neighbors to access books for readers of all ages and backgrounds. This love of books is part of another passion of Jan’s. When she is not actively helping out her community, Jan organizes conventions for those interested in science fiction and fantasy. Mike became involved with TND as a participant in Neighborcircles, a series of dinners held in a community members' home. Prior to that, Mike claims he was "in the dark, not knowing how to get involved". He was working two jobs, hardly interacted with his neighbors, and didn't really know much about what was going on in the community. Mike explained that TND provided the tools to stay connected and once he became connected, everything changed. He met other neighbors, started participating in countless events like safety walks, neighborhood meetings and clean ups, and in 2007 he co-founded a resident group called the Community Enhancement Team. Mike says he has been on a journey -- eager to learn and eager to bridge the divisions within the community and this desire was apparent one day by the soon-to-be Box District Park. Before the City developed the Box District Park, there was a North Bellingham Hill Revitalization Plan that provided an opportunity for residents, TND and Chelsea City officials to talk about their visions for change in the neighborhood. Creating safe spaces for children to play was one of the priorities identified by area residents. Not long after the North Bellingham Hill Plan was completed, Mike joined a group of stakeholders that helped to design the Box District Park. The planning group took a field trip to what was then an empty lot at the end of Gerrish Avenue. While people were talking, Mike noticed a woman and her children on the outskirts looking on. Mike crossed the street and walked up to the woman. The woman was curious about what was going on, but she didn't speak English so she was watching from the side. Mike described the plans that TND and the City had for the area -- that they were going to build housing and a park that would be open to the community for her kids to enjoy. He then brought the woman and her children over to see the proposed blueprint of the Box District Park. Jay Ash, who was Chelsea’s City Manager at the time, was at the park that day. Soon after he brought Mike on to led recycling efforts for the City. On any given day, you are likely to see Mike Sandoval walking around picking up trash, but this isn't because it is his job; it is because he believes in taking care of his community both on and off the clock. Together with members of the Community Enhancement Team, a former dumping ground at the corner of Willow and Marlborough was transformed. Since adopting this area in 2016, the group has transformed it into a beautiful space filled with sunflowers. For the past three years, Mike Sandoval has visited this site 3-5 times per week to collect trash, weed or water the plants. This commitment illustrates Mike's dedication to his City, and the beautiful sunflowers that transform the area during the summer is as Mike would say "a beautiful example of what the community can accomplish through connecting. Mike, "Mr. Chelsea" as some would call him, constantly pushes himself and the community to strive for better things. On behalf of TND and the City of Chelsea, thank you Mike for all your hard work over the years.